Posted October 30, 2014 by Lucia Osborne-Crowley & filed under City News. The NSW Upper House has ordered the state government to release all documents relating to its controversial reforms to homelessness services. The reform package, called Going Home Staying Home, introduced competitive tendering to homelessness services across NSW. The tender process resulted in the takeover of all of NSW’s women’s only refuges and women’s specific services, causing a backlash from the community. Many inner city women’s services were taken over by large organisations in late August after these organisations won control of the services through the competitive tendering process. Given that staff at these services had been providing specialised care for several decades, the fact that they were not successful in winning tenders for funding confused many members of the community. This led community activists to question the basis on which tenders were awarded under the Going Home Staying Home reforms. 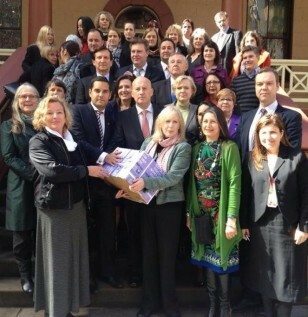 A series of community protests against the reform culminated in a petition of over 14,000 signatures being presented to NSW Parliament by the NSW Opposition in late August. The petition called for an explanation of the controversial funding reforms, and led to their content being debated in Parliament. Last week, it was announced that Parliament had passed a motion to demand the government reveal all documents relating to the awarding of Going Home Staying Home tenders. “All relevant documents will be provided to Parliament as required,” A spokesperson from the Department of Family and Community Services (FACS) confirmed. According to Save Our Women’s Services spokesperson Sam Wills, this will allow members of the community to scrutinise the tender process and examine why experienced specialist services were denied tenders. “We are going to be looking at how and why the government made the decisions they did during the competitive tendering process,” she said. City of Sydney Labor Councillor Linda Scott has also opposed the reforms since they were announced by the government. Cr Scott said she considers this motion a win for transparency and hopes it serves as a cautionary tale in regards to any future secretive tendering process. “I’m pleased that the process of Going Home Staying Home will be made transparent because I think this is an example that we should all learn from. This should never be repeated in New South Wales,” she said. Labor MPs Linda Burney and Sophie Cotsis were also very active in the campaign to make the Going Home Staying Home process transparent. “This move to force the Liberals to release all documents is a clear win for all concerned – finally the lid will be lifted on this botched process,” Shadow Minister for Family and Community Services Linda Burney said. “Only after massive community outcry did the Liberals suddenly discover some additional funds, rewrote some contracts and reopened finalised tenders. The question is why was this process so flawed?” said Shadow Minister for Women Sophie Cotsis. In the same week as the decision was made by Parliament to compel the state government to release all tender documents, the NSW Department of Family and Community services has announced it will ensure four out of twelve inner city homelessness services will remain women’s only. “There are four specialist homelessness services funded for women only, with or without children, under Going Home Staying Home (GHSH) in inner city Sydney,” A FACS spokesperson said. Under new Going Home Staying Home contracts, the Department has also addressed the community concern raised about allowing women to share refuges with men. “Women will not be made to share crisis accommodation with men. The new contracts under GHSH will ensure that women and men cannot be housed in the same property unless related to each other and a full risk assessment has been undertaken,” the spokesperson said.